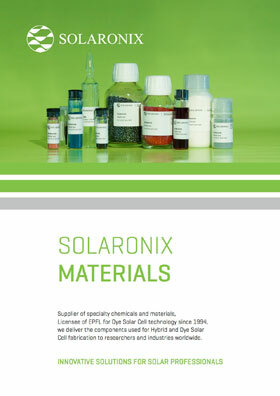 The product catalog of Solaronix encompasses all the ingredients for Perovskite Solar Cells, Dye Solar Cells, and similar photo-electrochemical devices. Our products are available in tailored quantities for both research and industry, and we continually scale-up and introduce new products to sustain the market's growing demand. The Ti-Nanoxide products are a complete range of titanium dioxide pastes for fabrication of nano-porous photo-anodes in Dye Solar Cells. They come in formulations for various deposition techniques and different layer aspects. Zr-Nanoxide is a printable zirconium oxide paste that forms a porous and electrically insulating layer. Zr-Nanoxide is targeted for the assembly of monolithic Dye Solar Cells and monolithic Perovskite Solar Cells. Mesoporous alumina layers made from Al-Nanoxide pastes can be used in perovskite solar cells as a scaffold layer in lieu of titania, but may also be employed as an insulation layer in monolithic perovskite solar cell architectures. A recent introduction to our portfolio, the all new Ni-Nanoxide is a printable nickel oxide paste for fabrication of photo-cathodes in reverse (p-type) Dye Solar Cells. Our novel carbon pastes are specifically geared for the manufacturing of highly conductive carbon electrodes. 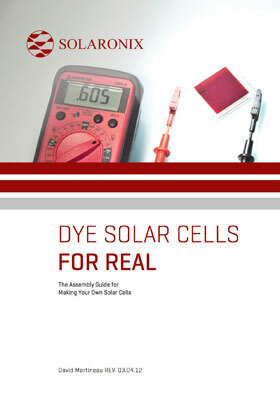 They allow for the replacement of the glass or metal counter-electrodes in monolithic assemblies of Dye Solar Cells or Perovskite Solar Cells. Meet Elcosil, the ink to print electrically conductive silver tracks on your devices. The Platisol products are a set of chemical precursors for the deposition of catalytic platinum layers in cathode fabrication. Available in a liquid paint or a viscous paste, Platisol products are suitable for most deposition techniques. Hole transport materials and precursors for perovskite solar cells. The Ruthenizer products are a set of ruthenium dyes for the sensitization of wide band-gap semi-conductor like titanium dioxide in Dye Solar Cells. Solaronix offers high purity ruthenium dyes in both retail and industrial quantities. Our offer of photo-sensitizers also extends to purely organic dyes. 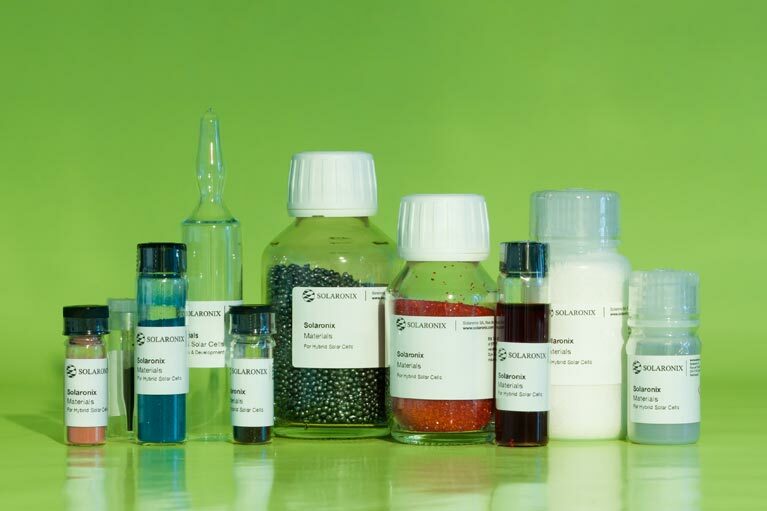 The Sensidizer products not only bring alternatives to ruthenium pigments, but also comprise dye molecules for solid-state Dye Solar Cells. The Iodolyte products are a range of iodide-based electrolytes carefully developed with state-of-the-art additives to ensure excellent solar cell performance and durability. As an alternative to solvent-based electrolytes, the Mosalyte products are non-volatile electrolyte formulations based on ionic liquids. They are compatible with more diverse sealing processes, and allow for outstanding solar cell durability. For whose desiring to experiment with their own electrolyte formulations, the IonLic products are a set of solar-grade ionic liquids which can be used as additives or solvent replacement. A selection of conductive and transparent substrates suitable for the assembly of solar cells or similar electrochemical devices. Several thicknesses and sheet resistivities are available, among the most conductive found on the market today. The Meltonix hot-melt sealing films are the material of choice for the lamination of solar cell electrodes. Their excellent chemical compatibility ensure a proper confinement of electrolyte. Available in different thicknesses.